MUSIKMESSE 2014: Korg has launched two new guitar products, the Rimpitch acoustic guitar tuner and Nuvibe modulation effects pedal. First up comes the Rimpitch, a tuner that attaches to acoustic guitar soundholes and allows players to tune up by simply looking down and engaging the tuner. To our mind it's probably more convenient than a headstock tuner, and if you don't have a pedal tuner it's certainly an alternative for live performance - as long as you don't mind the way the thing looks. The Rimpitch is expected to be made available in May with a street price of around £19 / $30. Also being unveiled at Musikmesse is the Nuvibe, a re-born modulation pedal that found popularity with guitarists in the later '60s. Korg teamed up with the original designer of the pedal and redesigned it for modern stage use, while retaining that chunky retro look. As wel as replicating the modulation effects of the original pedal, the updated Nuvibe includes new WAVE sliders, which allow players to dial in their own LFO waveforms, true bypass and an expression pedal. The Nuvibe will ship in late April, with a retail price of £479.99 / $799. For more information visit the official Korg website. 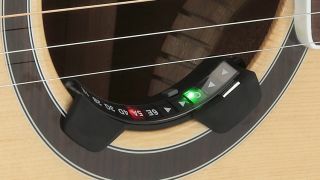 The new style of tuner for the acoustic guitar; a tuner that can be attached to the sound hole. Since the KORG AW-1 appeared, clip-on tuners have been the standard for tuning an acoustic guitar. However, some guitarists may feel that a clip tuner attached to the headstock is too distant from the eye, and that it's annoying to have a tuner attached to the headstock. KORG has responded by releasing a revolutionary new tuner. The Rimpitch is a unique tuner that you use by attaching it to the sound hole of your acoustic guitar. It provides an incredibly convenient viewing angle, since you can see the tuning meter within the natural angle of your sight. With a compact size, it's visually unobtrusive since it fits inside the guitar's sound hole and besides being easy to fit and remove. To use the Rimpitch, you attach it to the lower side of the sound hole. This means that you'll be able to check the tuning meter at the closest possible distance within your natural angle of vision. Since it's attached in a position where only the performer can casually see it, it will be virtually unnoticed by the audience. This is the ideal tuner for people who don't want to appear to be using a tuner during a live performance. Since you can leave the Rimpitch attached when stowing your guitar in its case, transportation and storage could not be more convenient. *The Rimpitch is only for use with six-string acoustic guitars. The Rimpitch can be installed in round sound holes with a diameter of 100 mm±3 mm, allowing it to fit a wide range of acoustic guitars. There's a hook that keeps it from falling, and since the portion that touches the guitar is made of rubber, there's no danger that your valuable instrument will be scratched. The Rimpitch detects the pitch by sensing the vibration of the guitar body. Since the design places the piezo pickup close to the body of the guitar, the pitch is detected quickly and accurately. High-brightness LEDs are used for the tuning meter and for the string name indicator, ensuring excellent visibility even on a dimly-lit stage. The legendary modulation effect unit, reborn under the supervision of the developer of the original model! Reappearing after more than half a century, it's the Nuvibe. Loved by guitarists for decades, it's a Japanese made modulation-type effect unit that made a blazing debut at the Woodstock festival; you already know the one we're talking about. The inimitable sound of this distinctive modulation effect has captivated numerous guitarists and audiences. Yet, because only a very small number of the original units exist, and because the circuit itself was not accurately understood and its components were difficult to obtain, it was rare to have the opportunity to try out the unit that produced these famous sounds. Such factors elevated the original to a semi-divine status. Numerous clone models were produced by major manufacturers and boutique shops alike, but all of these remain facsimiles that are pale imitations of the original model. Now, this legendary classic has been reborn under the ideal circumstances of the original engineer's supervision. Starting with original circuits that simulate hard-to-obtain parts, the distinctive modulation sound has been perfectly reproduced. ・Resurrected under the supervision of the developer of the original model! New features for today's musicians have been added. ・Discrete design using 79 transistors. The CdS photoresistor that lies at the heart of the sound is simulated by an original circuit using transistors. It was during the 1960s when the original model first appeared. Its origin is so uncertain that even the people who were involved at that time are not sure of the circumstances through which this model went out into the world. What is clear is that in 1969, a legendary guitarist used it in a historic performance, drawing the attention of guitarists all around the world. Now for more than half a century, it has reigned as a great effect unit. This enigmatic classic in the history of effect devices has been reborn under the ideal conditions of the supervision of the original developer. As on the original model, it provides a switch for selecting either vibrato or chorus, and INTENSITY and SPEED knobs for producing that distinctive effect. The buffer circuit that has such an important impact on the sonic character has been also been newly redesigned by the original designer for the 21st century. And a great bonus: a dedicated expression pedal is also included. The CdS photoresistor at the heart of the original model is a component that varies its resistance according to the strength of light, and it produces a distinctive effect by using the varying brightness of a small lamp to modify the output signal. Unfortunately, this component is now restricted as a hazardous substance, and cannot be used. Finding a substitute for this part was an absolute requirement in order to match the original model, and this was the single most difficult impediment to overcome. Success was finally achieved with an original design created under the supervision of the original engineer: a discrete circuit that uses an astounding 79 transistors to form the heart of the Nuvibe. The Nuvibe is not simply a facsimile of the original model. It provides ten WAVE sliders that allow users to create their own LFO waveforms. This lets you produce a wide variety of effects including sounds faithful to the original model as well as your very own custom sounds. As on the original model, a dedicated expression pedal for controlling the modulation effect is included. Since this lets you use your foot to control the distinctive modulation, it's a great way to enhance your stage performances. There's also an unlatch switch that lets you cancel the modulation effect by returning the pedal to the heel-down position. Because we have meticulously recreated every detail, you can even take advantage of the unit's effect as a buffer amp just as on the original model. The Nuvibe contains numerous design features that meet today's needs. Its two-way power supply allows operation on batteries as well as with an AC adapter. It also features a true bypass design as required by guitarists who care about their sound.